Government sponsored, or initiated poisoning is in the headlines and all over the media these days. The poisoning of a former Russian spy and his daughter in the UK is not a first – poisoning seems to be part of the political power games from way back when, and continues to this day. Also in the news these days, particularly since the launch of a six-part Netflix series Wild Wild Country, are the events of Osho’s life during his stay in the USA, and his arrest by US Government authorities. The images and media footage of him being dragged across American in chains for 12 days, through multiple jails, — a trip that should not have taken more than 6 hours by plane — are still heartbreaking. Two years later, when back in India, Osho speaks in public about this. After being away for several weeks due to illness, Osho returns to hold his daily talks in Gautama the Buddha Auditorium where he explains in great detail his personal experiences surrounding the events that took place after he was illegally arrested in North Carolina. “I have been away from you much too long. It has been a very painful absence for me. For seven weeks continuously, I have been only filled with your love, your patience, your thirst, your longing. “These days were remarkable in many ways. Seven weeks ago, I had an ear infection. It was a simple thing and according to the best expert available here, Dr. Jog, it can be cured in four days at the most – but it continued for seven weeks…. “My personal physician, Dr. Amrito, immediately informed all the sannyasin doctors around the world and asked them to contact the best experts specializing in poisons. His own analysis was that unless I had been poisoned there was no possibility to explain why my body had lost all its resistance…. 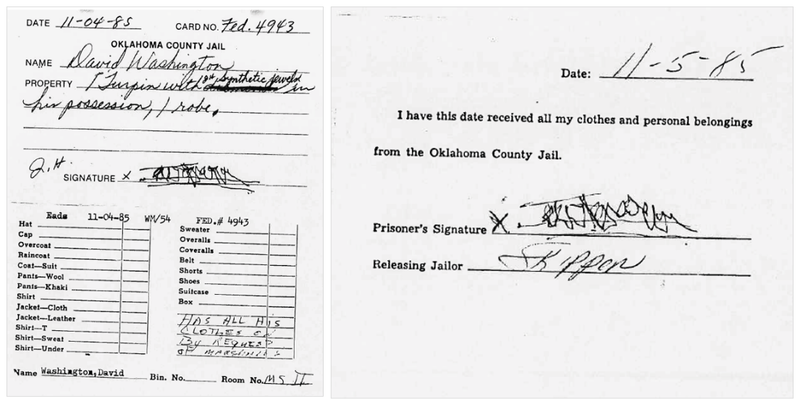 “I was taken from one jail to another. 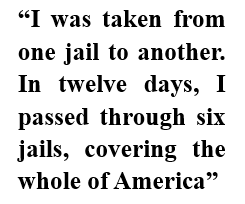 In twelve days, I passed through six jails, covering the whole of America. “I started thinking: What is their intention? What do they want to do indirectly? As I reached the jail their intention became very clear to me. “The idea was that if I had written David Washington and signed David Washington, I could be killed, poisoned, shot and there would be no proof that I had ever entered the jail. I was taken from the back door of the airport and entered the jail also from the back door. This happened in the middle of the night so that nobody would ever be aware of it – and only the U.S. Marshal was present in the office, nobody else. “David Washington” – an attempt to mislead the public of his whereabouts. Only with the help and persistence of the press he can finally be located. “He took me to the cell and told me to use one of the mattresses which was utterly dirty and full of cockroaches. ‘No blanket, no pillow. This is all you get.’ And he locked the door of that small dirty cabin. “He said nothing and simply closed the door. The breakfast was not much, just two slices of bread soaked in a certain sauce – I could not figure out what it was – tasteless, odorless…. “These are all symptoms of certain poisons. My hair has fallen out, my eyesight has become weaker, my beard has become as white as my father’s beard was when he was seventy-five. They have taken away almost twenty years of my life…. “One of the doctors, Dr. Dhyan Yogi, immediately took blood, urine and hair samples from me and went to England and Germany, to the top experts there. The European experts suggested that after two years the poison cannot be detected in the body, but all the symptoms show that a certain poison had been given…. “One of the experts, a doctor from Germany came twice to check the bone. He could not figure out what kind of disease it was – because there was no disease. The expert here – Dr. Hardikar, a man who loves me – has been continuously observing me here for three months, and has not been able to figure out why this pain should be there. “The European experts in England and Germany have suggested the name of a certain poison, thallium. The American experts have suggested a different poison which they think has been used by governments against rebellious individuals. The name is synthetic heroin. It is a thousand times more dangerous than ordinary heroin. All the symptoms are the same as with thallium, but the poison is more dangerous, and after two years it is not possible to find any trace of it in the body. “The Japanese experts, who have been working in Hiroshima and Nagasaki on atomic radioactivity, have suggested that these symptoms can also be created in a more sophisticated way by radioactive exposure – either while I was asleep, or from food exposed to radioactivity…. “Dr. Amrito’s own research… And he is a genius as far as medical science is concerned. He is a fellow of the Royal College of Physicians in England. He is a rare individual…. He has the highest qualifications. His own research is about a fourth, very uncommonly used poison. The name of the poison is fluorocarbon. This poison disappears immediately. Even within minutes, you cannot find any trace in the blood or urine – and all these symptoms indicate toward it. “It does not matter which poison has been given to me, but it is certain that I have been poisoned by Ronald Reagan’s American government…. “This was just ten minutes before the court was about to start. In the Federal Court, Judge Leavy asked me just about those two charges that had been chosen by my attorneys to be accepted because they were just formalities. It was strange that out of thirty-four charges, Judge Leavy immediately asked me only about those two: ‘Are you guilty of those two crimes or not?’ It is clear that Judge Leavy was also part of the whole conspiracy. “But I am a crazy man of my own type. I simply said, ‘I am.’ My attorney, Jack Ransom who was standing by my side, immediately added: ‘Guilty.’ So on the court record it has become the full sentence: “I am guilty.” I have not said that at all. I would rather be crucified than to accept a false charge. “He immediately pronounced his judgment. That too is a strange thing. The judgment had to be written after my acceptance or denial, but the judgment was ready-made. It was there on the table, he simply read it out. Perhaps the judgment had not even been written by him. Perhaps it had just been given to him. “The judgment was that I was to be fined four hundred thousand dollars. My attorneys were shocked. They could not believe that for those two formal charges, which were false, the fine was more than half a crore rupees [$ 5 Mill. ]; deportation from America and no entry for five years. If I should enter again, a ten year suspended jail sentence would have to be served. I was then told that I had to collect my clothes from the jail immediately and that my plane was waiting at the airport. I had to leave America immediately, so that I could not appeal in a higher court…. “One of my attorneys – and also my sannyasin – Swami Prem Niren is present here. I had left him two years before in tears in America, and he is still in tears – tears of love and trust and immense helplessness against the primitive, brutal, and violent heritage of man…. “It is an absolute certainty that I had been poisoned, and for these past seven weeks I have been in an immense struggle. “I don’t have any reason to live in the world. I have experienced, I have realized the very essence of eternal life. But something else forces me to linger a little longer on this shore, before leaving for the further shore beyond. It is you, it is your love. It is your eyes, it is your hearts. “And when I say ‘you,’ I don’t mean only those who are present here; I also mean all those who are spread all over the earth – my people. I would like these small sprouts to become trees. I would like to see the spring come to you all; the flowering of your ultimate being; the blissfulness and the ecstasy of enlightenment – the taste of the beyond…. “I was struggling with death. It was a fight between death and your love. And you should celebrate that your love has been victorious. “This time Jesus has been crucified in America by Christians themselves…. “These past seven weeks, I have been only thinking of you. It would have been immensely painful for me to leave you in this beautiful state when you have started growing upward. My garden is still a nursery…. “I have no complaint against those who have poisoned me. I can forgive them easily. They certainly do not know what they go on doing. “It is said that history repeats itself. It is not history that repeats itself; it is the unconsciousness of man, the blindness of man that repeats itself. The day man becomes conscious, alert and aware, there will not be repetition anymore. Socrates will not be poisoned, Jesus will not be crucified, al-Hillaj Mansoor will not be murdered and butchered. And these are our best flowers, they are our highest peaks. They are our destinies, they are our future. They are our intrinsic potential which has become actual…. “I have absolute inner certainty: they may have been able to poison my body, my nervous system, but they cannot destroy my consciousness, they cannot poison my being. It was good that they had given me a chance to see myself beyond my body, beyond my mind…. “Remember it: I am here for you. “That remembrance will help you not to go astray. That remembrance will help you to be aware of the uncivilized world in which we are living; in this madhouse that we call humanity. It will go on reminding you that we have to give birth to a new man and to a new humanity. “This is the tremendous challenge. Those who have guts, intelligence and a desire, a longing to touch the farthest stars… Only those very few people have been able to understand me, have been able to become my fellow travelers. I don’t have any followers – I have only lovers, friends and fellow travelers.